CAN EARN YOU SOME PROFITS! 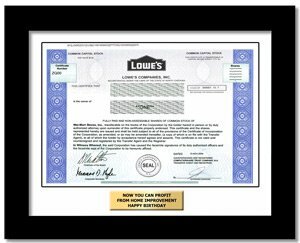 Lowe's Companies, Inc. is a home improvement retailer, with a specific emphasis on retail do-it-yourself (DIY) and commercial business customers. Lowe's specializes in offering products and services for home improvement, home decor, home maintenance, home repair and remodeling and maintenance of commercial buildings. Excellent choice for do-it-yourselfers, as well as home improvement, construction and building professionals. This is a biggie on Fathers Day and Dad's birthday.